On Sunday night, for the second time in five seasons, the Giants beat the Patriots to win the Super Bowl. 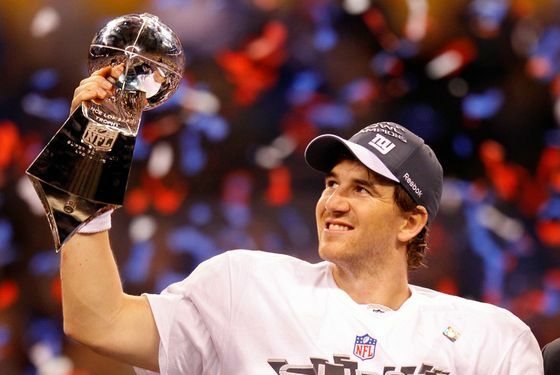 And also for the second time in five seasons, Eli Manning was named the game's MVP. Next came the celebratory songs, and then the parade down the Canyon of Heroes, plus the occasional photo of a grumpy Massachusetts native who lost a bet on the game. But what happened this week that didn't involve officially licensed Super Bowl XLVI champion rotating lamps? Jeremy Lin dropped 28 points on the Jazz, then 23 more on the Wizards. Speaking of Harvard grads, we looked back at the career of former Knick Ed Smith. The Rangers lost to New Jersey in controversial fashion, then beat Tampa Bay in overtime. Tyson Chandler once again topped our Knicks Power Rankings. We looked at how Gus Johnson has become a terrible announcer. And we chatted with former Knick Bernard King. That's it for us. Have a great weekend.